Perfect for creating your own unique designs and repairing your favourite clothes, our fantastic range of Singer Sewing Machines appeal to those who enjoy sewing in their spare time, as well as professional seamstresses. Offering precision sewing at its best, pre-programmed settings, as well as the versatility to complete a diverse range of sewing projects, a Singer Sewing Machine will never let you down. 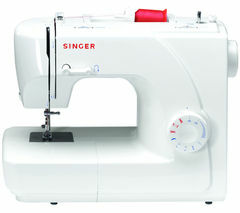 Within this range, you will find a great selection of Singer sewing machines including the Singer 7465 Sewing Machine, the Singer 1507 Sewing Machine and the Singer 2263 Sewing Machine. 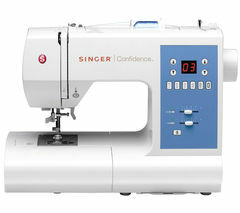 One of the most popular items within this collection is the high performance Singer 7465 Sewing Machine. Featuring 50 built in stitch patterns, a push button stitch selector, automatic settings, an automatic needle threader and automatic tension, this performance focused machine is a great choice for anyone looking for a fully electronic sewing machine that offers outstanding precision. The easy to navigate electronic display will also allow you to select from decorative, stretch, quilting and utility stitches, meaning you can adapt your machine to accommodate the requirements of different sewing tasks and projects. But that’s not all, The Singer 7465 is also pre-programmed with 50 different stitch patterns, allowing you to achieve the same great results every time. Auto tension means whatever material you are working with - from denim to knitwear, and even super stretch materials, you will always be able to achieve a consistent finish. So, if you’re looking for a Singer Sewing Machine that really does have it all, you have certainly landed in the right place. Remember, if you have any questions about any of our products, please do not hesitate to get in touch. Working with a huge selection of the industry’s leading names, we provide a whole host of other everyday electrical including steam irons and kettles.